has some other sort of damage and requires repair. more damage to the surrounding areas, we then use a paver extractor or flat pry bars to carefully remove the pavers, once the first few pavers are removed the rest should come out pretty easily. Preparing The Area Once the paver or pavers have been removed, the base below the pavers is then prepared. If this is a sand installation, we will need to wet the area and add more sand to relevel the area. If it's an aggregate installation, the area will need to be compacted and more base added, compacted again and releveled. 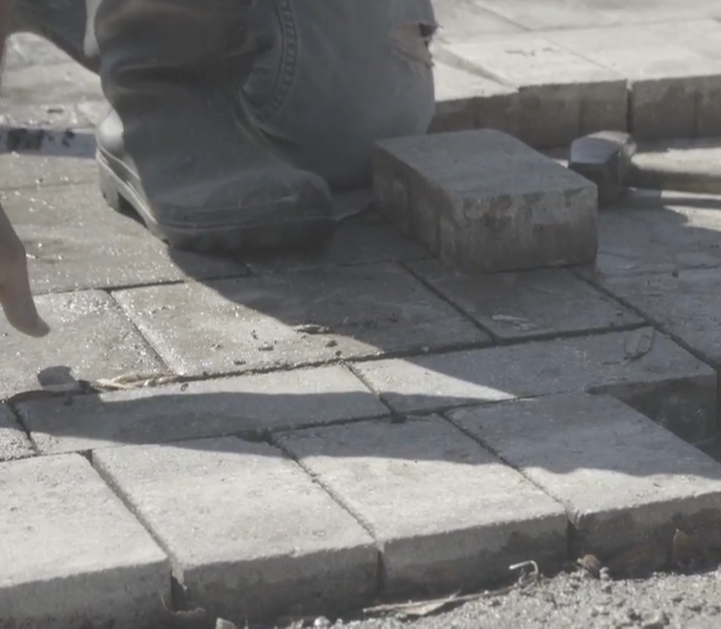 The most important part of this process is making sure the base area is prepared correctly, if the area is not leveled correctly the pavers will not sit level and can create a tripping hazard. Reinstalling The Pavers Once we feel the base area is smooth, level and even with the surrounding areas its time to start reinstalling the pavers. This is not as simple as just plopping the pavers back in the hole! Even though the base seems to be level, the pavers will more than likely need to be leveled to match the surrounding area with a mallet or a plate compactor depending on the size of the job. This may mean taking out or adding additional material to the area before setting the paver in place. Border Repairs If the area requires a border repair we will remove the standard ramped concrete edge restraint, relevel the border and reinstall it on our concrete footer system. We don't use the standard ramped edge restraint because its ugly, the grass never grows back to the edge of the pavers and it will fail every time and need to be replaced again. Replacing Joint Sand Once the pavers are set and satisfactory we will either use a multi grain silica sand or a polymeric sand depending on the application. The area will be ready for use when this step is completed.